Home > Discography > YEAH! UK Release Date - 22nd May 2006. US Release Date - 23rd May 2006. Album Type - Studio Covers Album. Family - John 'Bro' Campbell (Saxophone)/Anita Collen/Kristine Elliott (Backing Vocals). Backing Vocals - Stevie-Vann Lange/Justin Hawkins/Emm Gryner/Marc Danzeisen/Jesse Sheely. Piano - Dave Browne (Slade/Jobriath Songs)/Emm Gryner (Mott The Hoople Song). Strings - Stepaside Symphonia Conducted By Ronan McHugh. UK Record Label - Universal. US Record Label - Mercury/Universal. Unreleased Covers From Album Sessions - Kick Out The Jams (MC5). Special Formats - US Target/Best Buy Editions with bonus tracks. Special Formats - US Wal-Mart Bonus CD with extra tracks/Interviews. 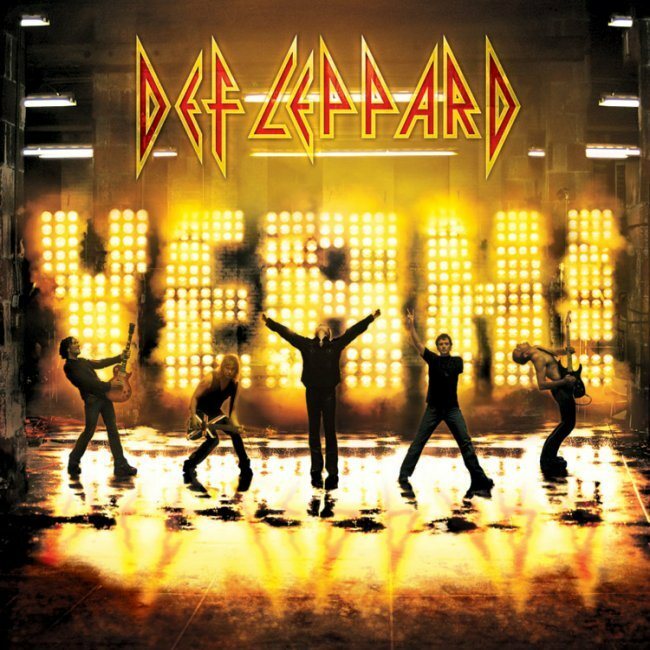 In May 2006 Def Leppard were finally able to release their first covers album called "YEAH!". The idea for the album was a long held dream of Joe Elliott's who came up with the cover art concept and title. The band recorded over 20 songs for the album. Including the singles 'Rock On' and '20th Century Boy'. The album entered in the Top 20 of the US album charts but did not reach the Top 40 in the UK - mostly due to lack of promotion by the record company. 22 songs in all were released over the various formats with bonus tracks and special editions. The inner sleeve booklet features reproductions of the original artists' album photographs by Mick Rock who had also taken the originals. Sav portrayed Freddie Mercury, Viv (Marc Bolan), Phil (Iggy Pop), Joe (David Bowie) and Rick (Lou Reed). The booklet also contains introductions from Sav and Viv plus song comments by Joe and Phil. 'Waterloo Sunset', 'No Matter What' and 'Stay With Me' were slightly remixed from the Best Of/Rock Of Ages/Now B-Side versions. Covers of MC5's 'Kick Out The Jams' and Police's 'Roxanne' (Phil Collen lead vocals) remain unreleased.